52 year old Melissa Ann Miller, of Onalaska, in District Judge Kaycee Jones' 411th District Court on Tuesday morning (09/25/18). Miller is with her lawyer, Seth Evans. Onalaska Woman On Trial for Intoxication Assault and Manslaughter in 2016 Accident, LIVINGSTON, September 25, 2018 - Trial got under way for an Onalaska Woman who's been charged with murder in the June 2016 accident when the SUV that she was driving crossed the center line on FM-356 (north of Onalaska) and struck a husband and wife who were riding on a motorcycle. The accident ultimately cost the husband (James Bradberry) his life when he passed away from massive injuries sustained from the accident. The wife, Melissa Bradberry lost a leg, a finger and her husband. The driver of the SUV that was allegedly intoxicated, Melissa Ann Miller, 52, of Onalaska has been charged with murder. During opening arguments, Assistant District Attorney, Beverly Armstrong, stated to the jury that when Melissa Bradbury woke from a coma, she woke to find that she had lost a finger, her left leg, and her husband, and she didn't even know how or why it happened. The horrible accident happened when the Bradberrys were north-bound on FM-356 North and Miller was south-bound. Evidence at the scene allegedly shows that Miller's vehicle crossed the center line and struck the Bradberrys. Miller's SUV grazed the motorcycle costing each of the Bradberrys their left leg. Both were ejected. Melissa Bradbury was ejected into an unkept ditch and it took emergency personnel several minutes to find her. Mr. Bradbury passed away a short time later from massive injuries. Mrs. Bradbury was flown by medical helicopter from a nearby landing zone. Miller was not injured. Miller had taken prescription pills prior to driving and toxicology reports show that Miller had methamphetamine in her system. 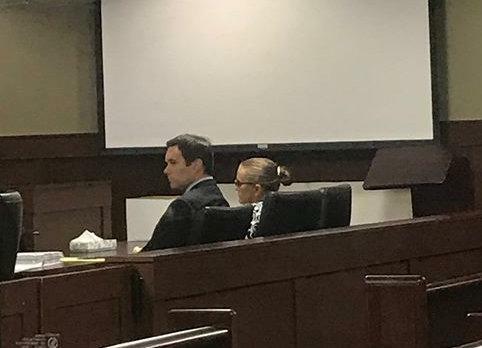 Miller's defense lawyer, Seth Evans, stated to the jury that while what happened was horrible and obviously very serious, he asked the jury not to become overwhelmed with emotion when listening to witness testimony from the witness stand. Evans further pointed out that it's very common for fatal accidents to happen and there's no intoxication involved (and no charges are filed). It appears that Evans is going to argue that Miller was not intoxicated when the accident occurred. Lead Investigator, Trooper Kevin Burman, with the Texas Highway Patrol, was called to the witness stand. Trooper Burman showed photographic evidence that showed that Miller's vehicle had crossed the center line. The pictures showed deep skid marks in the north-bound lane of 356. The skid marks led directly to Miller's vehicle that was slid to the south-bound shoulder. The skid marks occurred when the impact knocked Miller's driver's side front tire off it's axel and the suspension dug into the pavement and led directly to Miller's vehicle. Burman also used photographic evidence to show the jury the damage to Miller's vehicle and how it corroborated his findings. If found guilty, Miller will be facing substantial time in prison. The trial may last through Thursday.